The Visual Arts Society’s big event, ARTS FIESTA , is here once again! 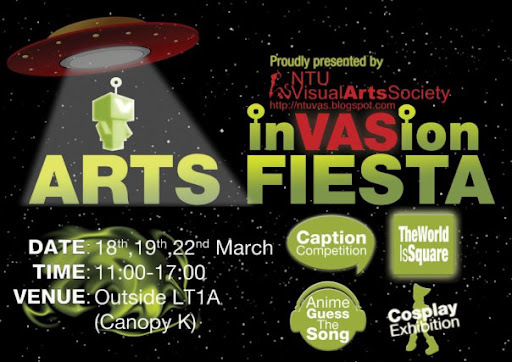 A mega event starring all three aspects of the VAS, AnimeWorks, Comics Ensemble and Designer’s Club, with our powers combined, we’ll be bringing you a veritable festival of activities and fun, right here in NTU, ON CAMPUS. Our theme for the year is Art inVASion . We will be having our official opening ceremony on the 18th March 2010, 12pm. Enjoy a LIVE acoustic singing performance after a ceremony.Cosplay fans will get to enjoy exciting Cosplay & Anime dance performances on Friday and Monday as well! Click on Read more to find out what activities we have in store! "Fill the captions with creativity!" Think that you can write better lines than the comic authors? Come & take up the challenge! Organized by Comics Ensemble. There's $150 worth of Books Kinokuniya vouchers to be won! Don't worry about how good you can draw, you just need to be creative, create a character based on the pixels!Organized by Designers' Club. The top winners stand to get $80, $50 and $30 worth of Kinokuniya vouchers! "Listen and Guess the song titles to win tons of prizes!" Back by popular demand! Guess the song name, the singer or the anime, the more you know, the more points you get! Organized by AnimeWorks . Lots of attractive anime goods to be won! That's not the end of it! Expect a sprawling shopping bazaar, Anime Merchandise from famous local supplier KKnM air-brush tattooing, among the many activities that await you at the event. Hope to see you there!